Spending couple of months or years in research seems less difficult as compared to presenting it. Presenting your research work to a bunch of experts can be very difficult sometimes. Your audience will only like well-crafted presentation. There are certain things you need to take care of. Presenting a research paper is quite different from a talk or any other presentation. In research paper presentation, you are going to discuss everything that you have done and achieved during your research in limited time. 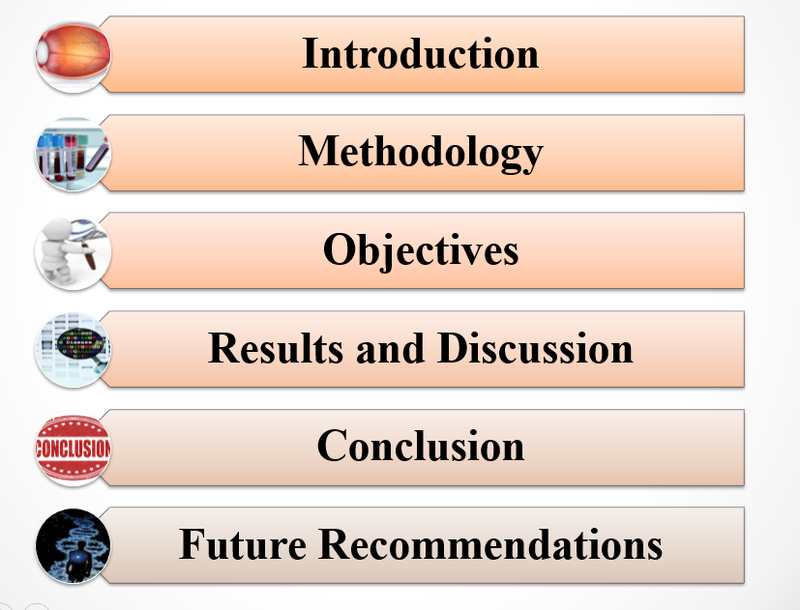 There is a specific outline that experts recommend that you must follow during your research paper presentation. disease. Focus on the things on which you have worked on. If you are working on genes of that disease then it will be important discuss the genetic pathways of the disease in your introduction. You may discuss the “problem” on which you have worked on during your research. It’s about the recipe and spices of your research work. Mention all the materials that were required to do the task and how miraculously you did it. Using flowcharts in your PowerPoint slides can help you to present it in the more engaging way. Try to fit it in 2 slides only. Emphasis on any special equipment or build that you have used during your work. Tell your audience about the verifiable objectives you had while doing this research. It doesn’t matter if they vary from your results, it is necessary to tell the audience what were you looking for. Write down your results, most possibly in the form of the table. Try not to confuse your audience with so much numerical data so charts will work fine. Highlight if you have something novel in your results. Try to interpret your results in 2-3 points. The conclusion must be very meaningful for audiences. It must not be ambiguous. Usually, a single statement is enough. What can be done more on your particle topic? This is very important if you are going to pursue the same topic in your further studies. It will help you to have a future objective for yourself. There should be 5*5 rules in each slide. I.e. there are five words in one sentence and there should be five lines on one slide. Data should be in the form of small key points or bullets. Data should not be in paragraph form on the slide. It should be precise. Slides are not for the audience it just hints for the presenter. The presenter should explain all terms and every concept that is written on slide. Standard heading size is 44 while standard text size is 32. Make link of one slide with the second slide during the presentation. For example, tell the audience what they will listen and see in next slide. The template of PowerPoint presentation should not have shocking color. Text color should be in contrast with template color. If somewhere in slides text color is same as template audience would not be able to see what is written on it. There should be slide number on every slide except title slide. All slides should be in homogeneity. The presenter should use either upper case or lower case alphabets in the text of the whole presentation. There should be the use of animations but no use of transitions. There should be a table of content of presentation on the slide next to title slide. By explaining this presenter should give an overview of the whole presentation. To help our readers, I have made a template for paper presentation. I hope it will be helpful for you. Research paper presentation sample Download. Thank you for your kind response. I have pinned your request in our priority to-do list. Keep visiting our site. well articulated. thanks for sharing this. can you send me the file? the file cant be read.